Yamunotri is another pilgrimage site located in the state of Uttarakhand. Check out travel and tourism in Yamunotri, India. Perched amidst sprawling Garhwal Hills, Yamunotri is another revered pilgrim spots in the state of Uttarakhand. It is one of the Char Dham in India and holds great religious importance. 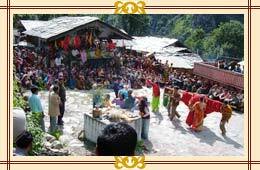 Yamunotri is the source of sacred river Yamuna and also the abode of goddess Yamuna. It is famous for its thermal springs, glaciers and scenic locales. In effect, it is one of the must visit places from travel and tourism point of view.